Apple Cottage in Culmington, near Ludlow sleeps 4 people. Apple Cottage near Ludlow is set in the small village of Culmington in the picturesque Corve Dale Valley. This single-storey, beamed barn conversion with a vaulted ceiling and cosy wood burner, has been stylishly renovated and provides an ideal year-round romantic holiday home. There is also a selection of books, a sitting-out area to the front of the cottage and shared use of communal grounds with stunning views. Nearby are The Clee and Long Mynd hills, Stiperstones and Wenlock Edge, all of which are a walkers paradise. The medieval town of Ludlow, 5 miles, has a racecourse, 13th century castle, wonderful architecture, street markets, antique shops and Michelin-starred restaurants. Visit Church Stretton, known as Little Switzerland, Ironbridge and Shrewsbury, with its wonderful buildings, shops and riverside walks. The shop, pub and restaurant are all 4 miles from Apple Cottage near Ludlow. Apple Cottage is all on ground floor: Living room with double sofa bed (for alternative sleeping)/dining room/kitchen. 1 double (5ft) bedroom. Bathroom with bath, shower cubicle and toilet. Most rooms with beams and flagstone floor. Wood burner in living room (initial fuel included). Economy 7 central heating, electricity, bed linen and towels included. Travel cot and high chair on request. Freeview TV. DVD and small library. Electric cooker. Microwave. Washing machine. Dishwasher. Freezer. Wi-Fi. Telephone-incoming and emergency calls only. Sitting-out area and furniture. Shared grounds. Parking (1 car). Welcome pack. No smoking. Holidays at Apple Cottage near Ludlow run from Friday to Friday. Pets allowed at Apple Cottage. For a better idea of where Apple Cottage is, you can see Apple Cottage on the map below. 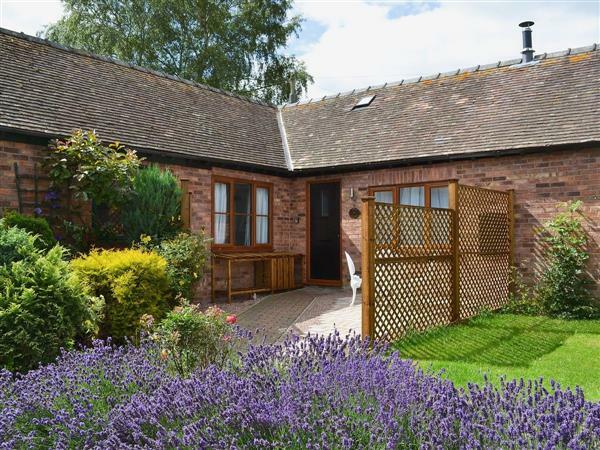 Apple Cottage is in Shropshire; should you be on the lookout for a special offer, you can find all the special offers in Shropshire. It's always worth checking to see what is on offer at the moment. Do you want to holiday near Apple Cottage (W43460), you can see other cottages within 25 miles of Apple Cottage; have a look to find your perfect holiday location.